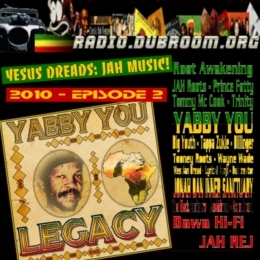 WWW, May 2010 - Centered around the brand new re-release “Legacy” by the Iriginal Jesus Dread Yabby You, the second episode of Radio Dubroom presents you with another selection of old and new, online and offline music. The show opens up with an extended Dub by US based Reggae Band Root Awakening, who was very hot in the days of MP3.com when online artists were getting more and more recognition as a force to deal with. There’s more music from that time and website: a smash hit called Ten Plagues, with music produced by Dubcreator and conscious lyrics sung by Lyrical Benji. Also, Jonah Dan and Jah Rej come with dubs from the MP3.com days. A healthy portion of contemporary online DUB is provided by the French Dawa Hi-Fi and I-Plant, who produced Tooney Roots’ crucial tune, the UK based Blackstarliners are there as well as Sushidread with Axon Sound. Also included in the mix are a couple uf tunes from the Dubroom’s Star Selections Net Label: a nice one by Prince Fatty One Dub by JAH Roots and two demo’s by the Dubroom Webmaster, tunes of which one riddim has never been released and the other just released as instrumental. The main focus on this episode of Radio Dubroom is reserved for the LEGACY BY YABBY YOU, a recent online re-release of some of the best material Yabby You either produced or voiced, or both. Crucial toasting by no less than four Star DJ’s, a pumping Dub and three nice vocals, of which two are voiced by the Iriginal Jesus Dread himself. The Dubroom deeply respects Yabby You for all the work he did musically and spiritually, so while he rests from his works in the Hands of the Almighty Father JAH, let us continue and promote upfullness. Please buy the album if you like the tunes!